This will be perfect for our future home! Luciane and Michael Anthony Furniture. The giveaway for the giant Paris map ends at midnight on 7/31. Hi Sherry! Oh, the little bistro set is darling! Those are some lovely homes and good luck on your search. Sherry what a great win. That bistro set is so cute! Good luck on the house hunting! The homes you are looking at are gorgeous! I love house hunting. Love your bistro set! Good luck with the house hunting. Congrats on winning that adorable bistro set. Lucky you!!! Good luck with the house hunting. all three of those homes are beauties. have fun!! I love the bistro set! Congrats on your win! Congratulations, that's quite a win! And good luck with the house hunting! The bistro set is perfect. Now you have to find a house that will have the perfect spot for it. The bistro set is so cute,I love that ice bucket in the middle. Great timing on the win! 🙂 Can't wait to see interior shots of all those gorgeous homes! Good Evening Sherry, Congratulations on winning this lovely bistro set. You must have been thrilled to pieces when you received the news. Good luck with your house hunting. The exterior of the homes which you shared look beautiful. Cheers for your fortuitous win of the furniture! Love your choice of the bistro set with ice bucket well! The homes you pictured all look interesting, so perhaps one thing to consider is which direction each home faces and another thing is how much yard work there will be. No doubt you can work wonders with any interior. I am so happy for you – and also can't WAIT to see some of those interiors. Sherry, what a wonderful gift! It will be perfect for your new home. Good luck with the search. 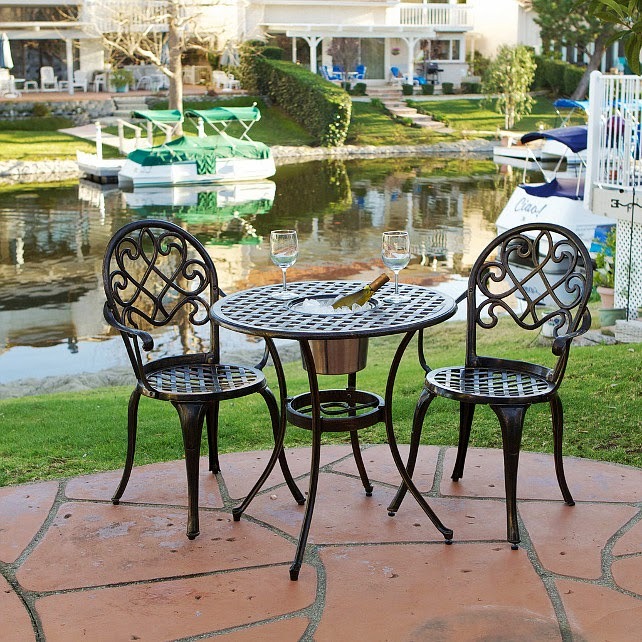 Love the bistro set, and all 3 of those homes are gorgeous! Sherry – thanks so much for the great post and congratulations on your win! We are thrilled one of our beautiful products will help you enjoy your new home! Wow!! What a prize, my goodness!! Congratulations. The bistro set is just darling! Good luck on your house hunt!